Researchers from the Wake Forest Baptist Medical Center published a study looking at whether meditation releases natural opioids to reduce pain. According to the lead author, Fadel Zeidan, Ph.D., their findings could be important for millions of chronic pain sufferers. The study analysed 78 healthy and pain-free volunteers, dividing them into four groups. The first control group comprised of those who meditated and took the Naxolone opioid. The second control group is the non-meditation control plus Naloxone. The third group did meditation plus took the saline placebo. Lastly, the fourth group was the non-meditation control with the saline placebo. They induced pain to the people in each group by heating a small area of the skin to 102.2 degrees. This was extremely painful for most people and the participants rated their pain on a sliding scale. The authors concluded that pain ratings reduced by 24% from the baseline measurement in the group using meditation and naloxone. This was important because even though the opioid receptors were chemically blocked, the pain levels still significantly reduced. They also noted that pain lowered in the meditation and saline placebo group by 21%. The non-meditation control group also reported an increase in their pain levels, whether they took the naloxone or the placebo-saline injection. This study provides strong evidence that meditation can potentially help with reducing pain. The study also showed that meditation doesn’t work through the body’s opioid system. 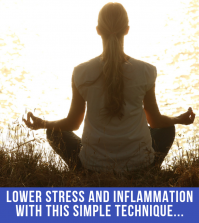 In addition, it provides more evidence that meditation is unique in its ability to reduce pain. It is therefore significant for anyone looking to find a non-additive method to reduce their pain. Combining meditation with another non-opioid such as serrapeptase could help to provide consistent pain relief for anyone. As Serrapeptase is a naturally-occuring enzyme, it can help to dissolve inflammation within the body. It then helps to safely eliminate the inflamed tissue. A pain free existence is possible when the focus is on meditation. In addition, using natural methods such as a healthy diet while combining this with Serrapeptase and exercise can literally eat away at the inflammatory tissue. This leaves the person pain free in the long term. For best results, Robert Redfern recommends the Serra Enzyme 80,000IU supplement and taking 2 capsules x 3 times a day. Alternatively, for those requiring a higher dose, we recommend the Serra Enzyme 250,000IU supplement, both of which are available from Good Health Naturally. Según un estudio reciente, la meditación o la práctica de mindfulness puede inducir el alivio natural del dolor sin el uso de opioides.